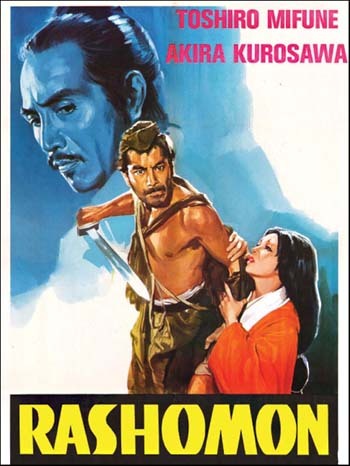 Rashomon is one of the greatest films by one of the greatest of all directors – the Japanese master Akira Kurosawa. Kurosawa’s career spanned 50 years and included such masterpieces as The Seven Samurai, Yojimbo, Kagemusha and Ran. He made Rashomon in 1950 and based his screenplay on two stories by Ryonosuke Akutagawa – a writer known as the father of the Japanese short story. Rashomon tells the story of an assault and murder from four different perspectives – leaving the viewer to decide which is the true account. This fascinating and revolutionary narrative technique had never been seen in cinema before and for that reason the film is a milestone in the medium. The luminous black and white cinematography also broke new ground – Kurosawa chose to shoot directly into the sun to great visual effect. He deployed multiple cameras to enable fluid editing in the finished film – it has nearly twice as many individual shots as a conventional movie of the time. Kurosawa cast the great Japanese actor Toshiro Mifune in the lead role – they were to collaborate on 16 occasions and although they fell out in later life each produced his best while working with the other. Like many of Kurosawa’s pictures Rashomon was remade by Hollywood in 1964 as The Outrage, a western starring Paul Newman. Rashomon won the Golden Lion at the Venice Film Festival in 1951 and an honorary Academy Award in 1952.